After U.S. Customs and Border Protection (“CBP”) released a limited, heavily edited “public version” of its Antidumping and Countervailing Duty Enforcement Actions and Compliance Initiatives report to Congress for fiscal year 2015 in January of this year, the Department of Homeland Security made public the entire report without redaction. The Department of Homeland Security’s website now houses CBP’s Antidumping and Countervailing Duty Enforcement Actions and Compliance Initiatives report to Congress for both fiscal year 2015 and fiscal year 2014. Over the past several years, CBP’s reports to Congress have shown significant growth in the amount of antidumping and countervailing duties deposited with the agency. In fiscal year 2015, CBP reported that importers deposited $1.17 billion in antidumping/countervailing duty cash deposits (p. 2), roughly twice the $508.8 million in antidumping/countervailing duty cash deposits made in fiscal year 2014 (p. 16). These increased deposits at import entry afford the agency greater security against eventual antidumping and countervailing duty liability in the United States’ retrospective duty assessment system. The importance of additional security is demonstrated by the amount of open bills for antidumping and countervailing duties on imports previously entered into the country, an amount that continues to grow significantly every year. CBP’s reporting indicates that for fiscal year 2015, the agency had a total of $191.2 million in uncollected antidumping and countervailing duties related to 52 different antidumping and countervailing duty orders. The additional sum brings the total of uncollected antidumping and countervailing duties from fiscal year 2001 through fiscal year 2015 to “approximately $2.6 billion” (p. 12). 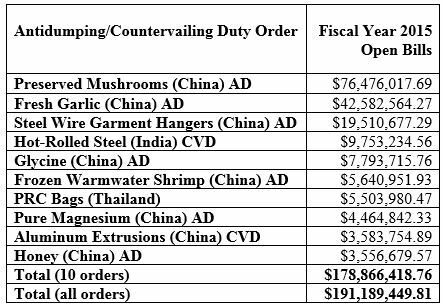 As the table above indicates, in fiscal year 2015, imports of preserved mushrooms and fresh garlic from China accounted for well over half of total uncollected duties on their own. Other imports from China – steel wire garment hangers, glycine, frozen warmwater shrimp, and aluminum extrusions – also accounted for tens of millions of dollars in uncollected duties. But, at the same time, CBP also reported millions of dollars in open bills related to hot-rolled steel imports from India and polyethylene retail carrier bags from Thailand. Although fiscal year 2016 data has not yet been released by CBP, early indications are that the amount of antidumping and countervailing duty cash deposits made by importers once again grew significantly. Moreover, in a filing made by the Department of Justice in a case litigated earlier this year at the U.S. Court of International Trade, CBP reported that the amount of uncollected duties on fresh garlic from China had increased – on its own – by $180 million between fiscal year 2015 and fiscal year 2016. Such a massive increase in uncollected duties with regard to a single antidumping duty order likely indicates even more dramatic growth in uncollected antidumping and countervailing duties in fiscal year 2016.